Merge two or more blogs into one. Have a few scattered blogs and want to get a fresh start? Now you can combine comments and posts from multiple blogs into a brand new blog. Move individual posts from blog to blog. Cross-publish your posts on multiple blogs, or transfer large batches of posts from one blog to another with a single click. Back up your blog to your own storage. It's never a bad idea to create backup copies of your own content, and now you can easily export an archival copy of your blog to your hard drive with a simple tool. Move your blog somewhere else. Our standard Atom XML export format will open up new blogging channels between providers, and let you take your content with you should you decide to move somewhere else. And of course, if you decide to come back to Blogger, importing your export file will get you back up and running in seconds. You can access Import and Export from the Blog Tools section on the Settings | Basic tab. 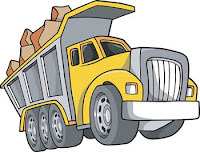 For some more detailed info on all of the things you can do with Import and Export, please check out our accompanying help article. Currently we only support importing Blogger blogs. We don't yet support importing from WordPress, Typepad, LiveJournal or any other blogging platforms. Before importing a blog for the first time, we recommend that you create a new, throwaway blog to import into so you get a sense for how the process works. Once you’re comfortable, import into your public blog. If you have enabled a content warning for your blog, then you will have to remove it before your blog can be exported. Today’s release features a brand new graduate from the Blogger in Draft testing ground: Import and Export for Blogger blogs. , which should be a real treat for all of you Blogger audiophiles out there. iLike brings music to your blog by letting you embed and share playlists that you make yourself. Using their simple interface, you can organize and arrange your tunes, then seamlessly integrate them into your blog's sidebar. To get started, head on over to the playlist editor and build up your list of tunes from the iLike database. When you are finished, simply click the orange 'Done!' button at the bottom of the page, and you will be taken to a preview of what your playlist will look like on Blogger. The iLike gadget will now show up in your blog's page elements editor for you to arrange as you wish. Pretty cool, eh? Keep in mind though that playlist editor feature of iLike is still technically in beta, so the usual caveats apply. However, if you are feeling extra entrepreneurial you could help out the iLike dev team by answering their quick survey. Sometimes we stumble across gadgets that are just too cool to keep to ourselves. And such is the case with the slick iLike gadget, which should be a real treat for all of you Blogger audiophiles out there. As some of you might know, AOL has recently decided to sunset its AOL Journals service. To help Journals users continue to share their thoughts online, Blogger has built a simple migration tool to move an AOL Journal to Blogger. We'd like to welcome our new Blogger users to the community and are looking forward to hearing what they have to say! We've been hard at work here at Blogger and have added a number of new features in the past few months. If you're a Journals user who wants to explore our features, or even if you're already a Blogger user but you want to see what's new, check out our features page. Over in our user group you can share your blog with others or find new blogs to follow. If you're still hungry for more blogs, the Blogger team regularly posts interesting and noteworthy Blogger-powered blogs at Blogs of Note. Below are some more resources for new Journals users. Welcome again! out of Blogger in draft and making it easily available to everyone. This feature puts the comment form at the bottom of each post page, below the comments, instead of on the separate, Blogger-styled page. The embedded comment form is more convenient for your readers because they can use it to post a comment immediately, without clicking over to a different page. It also looks better, since it matches your blog’s style and colors. If you’re logged in to Blogger with your Google Account, you can also subscribe to comments via email by clicking the “Subscribe” link. Unlike with the full page comment form, you don’t need to post a comment to subscribe. To enable the embedded comment form for your blog, go to the Settings > Comments page and look for the Comment Form Placement setting. Change it to Embedded below post, save your settings, and go check out a post to see the new form in action. The embedded comment form works on both Classic and Layouts templates, though if you’re using a heavily-customized Layouts template you may need to reset your widget templates before the embedded comment form will appear. We think that the embedded comment form is a big improvement, so we’ve made it the default setting for all new blogs. Today we’re bringing the embedded comment form out of Blogger in draft and making it easily available to everyone. This feature puts the comment form at the bottom of each post page, below the comments, instead of on the separate, Blogger-styled page.
. The feature lets readers publicly subscribe to your blog (so you know who's reading) and adds a Reading List to your Blogger Dashboard so readers can stay updated with the blogs they follow. Now it's available to all users in English. We'll keep you updated about when we launch it in Blogger's other languages. To learn more about Following, read the Blogger Buzz Post or the Google Blog Post. A few posts ago we let you know about Blogger Following. The feature lets readers publicly subscribe to your blog (so you know who's reading) and adds a Reading List to your Blogger Dashboard so readers can stay updated with the blogs they follow. For more than a year, you have been able to view all the photos you've uploaded to your blog in Picasa Web Albums. It's been good -- having a dedicated photo management interface comes in handy when you want to do things like embed Blogger photos elsewhere on the web, order prints, create slideshows, and so on. Today, Picasa Web Albums has undergone a significant redesign, and is launching a slew of new features to help you better organize and enjoy your photos, including all of your Blogger Photos. Along with a much-refined interface, there's a powerful new 'name tags' feature that helps organize your photo collection based on who's in each picture. For fun, check out the new Explore page, or take a look at the Recent Photos stream (unabashedly inspired by Blogger Play). Oh, and one more thing: If you use Picasa (the client software) to edit and organize all the photos on your PC, we're happy to report that Picasa's venerable 'BlogThis!' 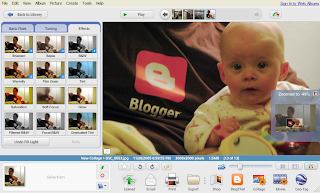 button still sits front-and-center in the next generation of Picasa software, which also launches today as Picasa 3 (beta). If you've never tried it before, now's a great time to start -- Picasa 3 includes plenty of new photo-editing goodies that can make your blog's pictures look better, like a powerful retouch tool, greatly revamped photo-collage and slideshow creators, simple video editing, desktop/web sync, and more. To learn more, swing by the Google Photos blog. Would you like to know who enjoys reading your blog? Or stay updated with your favorite blogs right from your Blogger dashboard? 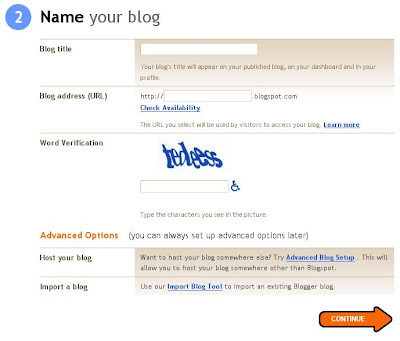 You can do those things and more with Blogger’s new Following feature. By following your blog, your readers tell you and the world that they’re a fan of what you post. Your Dashboard now shows you how many followers each of your blogs has. With a click on the Followers icon, you can browse your followers, see what blogs they write, and read the other blogs they’re following. 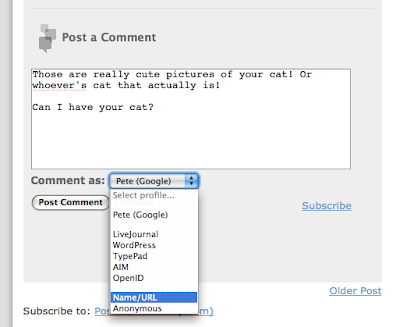 Now that you know who your Followers are, you can show them off by adding the Followers gadget to your blog’s sidebar. From the “Layout | Page Elements” tab, click “Add a Gadget” and select “Followers” from the gadgets list. The Followers gadget shows the profile pictures of your followers and gives your readers a “Follow This Blog” link to join up, too. Your followers can stay updated with your blog with the Reading List that we’ve added to the Blogger Dashboard. The Blogs I’m Following tab automatically shows the latest posts from all the blogs you follow. You can follow any blog from your reading list, even blogs that haven’t added the Followers widget or aren’t hosted on Blogger. Just click the “Add” button and type in the blog’s URL. And.... there's more to come! We are also in the process of integrating with Google Friend Connect so you can give your readers more engaging social features. How do I add the Followers gadget to my blog? As reported on Blogger Buster (and elsewhere), the 3rd party Add Widget API was broken. It has been fixed. The new button style appears clickable in all browers. The Blog List widget can show thumbnails specified in Media RSS feeds. Atom feeds now include the blog’s description as the <subtitle> element. There’s a new look for the Blogger Dashboard, which we think you’ll find more attractive and functional. If you have a ton of blogs (as we do) try out the “hide” and “show all” links to help manage the list. Google Gadgets in your Layouts blog can now set their height automatically (if the gadget author supports it). 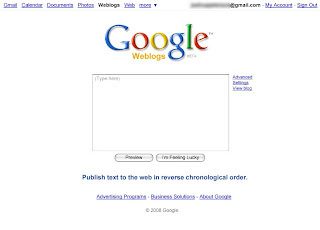 Read more about adding Google Gadgets to your blog. AdSense page elements can now optionally have image ads. We’ve found image ads have a higher click-through rate, so you might get more money if you turn them on. 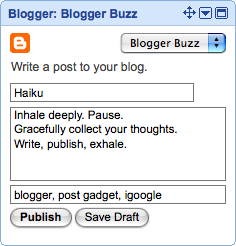 We wrote up a Features page to help you keep track of everything you can do with Blogger. Take a look and see if you’ve been missing out on something cool. The Flag Blog button in the Blogger navbar now pops up a window for you to tell us why you think the blog violates our terms of service. Flag Blog is always handled exclusively by human reviewers, not the automated spam locking system, so this information will better help them decide what, if any, action should be taken. Fixed Moto template header overlap in IE7. Blocked the /feedReaderJson URL from web crawlers, to reduce 404s in Webmaster Tools. 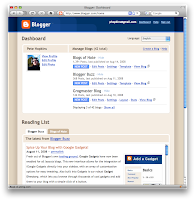 Button style and layout improvements throughout Blogger. Spice Up Your Blog with Google Gadgets! Fresh out of Blogger's own testing ground, Google Gadgets have now been enabled for all layouts blogs. This new interface allows for the integration of iGoogle Gadgets directly into your sidebar, with an array of customization options for easy tweaking. Also built into Gadgets is our robust Gadget Directory, which lets you browse through thousands of cool gadgets and add them to your blog with a simple click of a button. Gadgets have built-in configuration for easy integration into your layout. All gadgets are automatically sized to match the width of your sidebar, and their height in pixels can be adjusted using the Gadget's built-in options. Our large list of Gadgets is constantly growing and evolving. You can browse them all from our comprehensive Gadget Directory, which runs the gamut from sports updates to site counters, and flash games to local information tickers. To bring up the Gadget Directory, just click Add a Gadget from your layout. Have an idea for a gadget that isn't listed? Then build it yourself! We are always on the lookout for great ideas, so please submit your own creation to the iGoogle Gadget Directory, and then let us know about it in our Help Group— we may just add it to our 'Featured Gadgets' Section. Babies are all the buzz at Blogger. Within the last few months we've had three new additions to the Blogger Team: Ryan, Aditya, and Haley. Although it'll probably be a few years before they start sounding off themselves, we get to post some cute pics of them now. While we wish that every post on this blog could be about cool features or other Blogger news, sometimes we have to step in and admit a mistake. We've noticed that a number of users have had their blogs mistakenly marked as spam, and wanted to sound off real quick to let you know that, despite it being Friday afternoon, we are working hard to sort this out. So to those folks who have received an email saying that your blog has been classified as spam and can't post right now, we offer our sincere apologies for the trouble. We hope to have this resolved shortly, and appreciate your patience as we work through the kinks. Well, today we've announced its public launch, and we wanted to tell you a little bit more about it and how you might use it to complement your blog. Blogs are great for quickly and easily getting your latest writing out to your readers, while knols are better for when you want to write an authoritative article on a single topic. The tone is more formal, and, while it's easy to update the content and keep it fresh, knols aren't designed for continuously posting new content or threading. Know how to fix a leaky toilet, but don't want to write a blog about fixing up your house? In that case, Knol is for you. 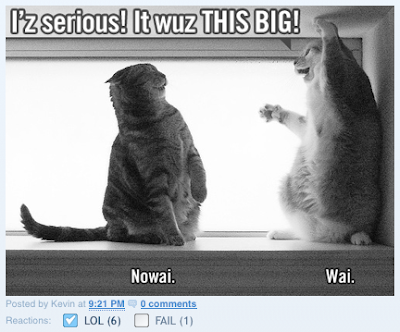 Except for the different format, you'll get all the things you've come to expect from Blogger in Knol. Like Blogger, Knol has simple web authoring tools that make it easy to collaborate, co-author, and publish. It has community features as well: Your readers will be able to add comments and rate your article, and, if you want, they'll be able to suggest edits that you can then either accept or reject. And, just like in Blogger, you can also choose to include ads from AdSense in your knols to perhaps make a little money. One other important difference between Knol and Blogger is that Knol encourages you to reveal your true identity. Knols are meant to be authoritative articles, and, therefore, they have a strong focus on authors and their credentials. We feel that this focus will help ensure that authors get credit for their work, make the content more credible. All in all, we think Knol will be a great new way for you to share what you know, inform people about an issue that is important to you, raise your profile as an expert in your field, and maybe even make some money from ads. Create your Knol right now for free. A few months ago, we announced a new web authoring tool called Knol. Comment moderation can now be automatically enabled after a fixed number of days. 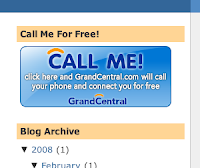 Spam interstitials now let readers click through to blogs. Blog feeds optionally include your email address. 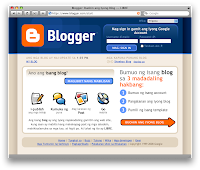 Blogger is now available in Malay! Blogger has a large base of users in Malaysia and we are excited to now bring them Blogger in their native language. Today we’re releasing a new page element for Layouts blogs: Blog List. The Blog List improves on our Link List page element by using blogs’ RSS and Atom feeds to show update times, post titles, and snippets. Thanks go out to everyone who chimed in on the Blogger in draft blog while this feature was being developed. You helped us a lot! Tip: Want to show more posts from a single blog? Use the Feed page element to put any RSS or Atom feed in your blog’s sidebar. 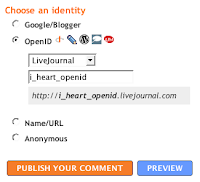 OpenID logins for comments now work when the OpenID URL redirects to another page. Layouts blogs will now display on Blog*Spot even when the template has invalid data: tags, rather than showing a bX code page. Performance improvements across Blogger.com and Blog*Spot. Enjoy! We’ll have a bit more to say about Blog List later today, as well as some new fixes and features on Blogger in draft. You can include YouTube videos, images, and text captions into slides to condense and display a “deck” of graphical content in a concise format in your posts. Google Docs is a free, web-based word processor, spreadsheet, and presentation application. Try it now. Scheduled post publishing, which we talked about testing on Blogger in draft last month, is now live for everyone. If you set a post’s date into the future, Blogger will wait to publish until that time comes. Have you ever wanted to announce something on a certain date but knew you wouldn’t be at a computer to make a post? Or you wanted to keep posting regularly but knew you’d be on vacation for a few weeks? Scheduled post publishing is here to help you out. 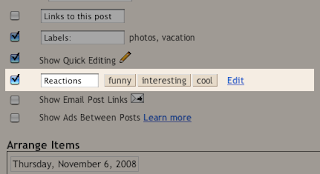 Scheduling a post is easy to do: on the post editor page, click the “Post Options” toggle to show the “Post date and time” fields. Then, type a post date and time that’s in the future. When you click the “Publish” button, your post will become “scheduled.” When the date and time of the post arrive, it will be automatically published to your blog. “Scheduled” posts appear in your Edit Posts list alongside your drafts and published posts. To un-schedule a post, simply save it as a draft any time before it gets published. One quick note: If you want to give a post a date in the future but have it appear on your blog now, you’ll need to add in an extra step. First, publish your post with the current date and time. This will make it appear on your blog. Then, edit the post to change the date into the future and publish it again. We don’t re-schedule posts that are already published, so the post will stay on your blog but sort to the very top. The same is true of future dated posts you’ve already made, so there’s no need to worry about your existing posts disappearing, or having your blog assaulted by unplanned entries in, say, 2027. P.S. : Thanks to everyone who tested this out on Blogger in draft and posted comments! We appreciate your time and effort. The “Add another image” link in the image upload box now works even if you haven’t filled in a URL. The labels field in the post editor autocompletes more predictably when one label starts with the same words as another. URLs in the Name / URL part of the comment form are now validated. Header fixes for the 897 and 565 templates. The draft / published / scheduled filters on the Edit Posts list now work reliably in Internet Explorer. Videos uploaded through Sony Ericsson phones now appear as enclosures in the blog’s Atom and RSS feeds, so they can be retrieved with a video podcast client. Miscellaneous typos and translations corrected. New blogs have OpenID commenting enabled by default. XFN rel="me" links between blogs and profiles. Adding more than 5 poll choices now works in Internet Explorer. The search box on the Edit Posts page is now available in all supported languages. New “Related Resources” box on the Dashboard links to AdSense, Google Reader, and Picasa Web Albums. We haven’t made one of these posts for a while, so here’s a quick summary of some of the changes and fixes we’ve made today and in the past few weeks. So long, and thanks for all the zen! We’re bidding farewell today to Eric Case. 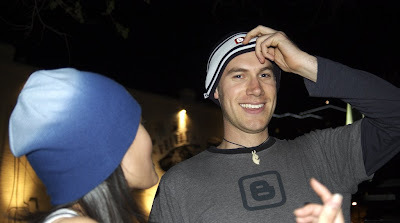 Eric joined Google five years ago so that he could do something — anything — for Blogger. Since then, he’s answered support tickets, launched blogs, designed features, hung out with MC Hammer, eaten very slowly without drinking, and, for the past year, been our product manager, with all that that entails. We’ll miss you, Eric! You made Blogger better. Good luck with your next endeavors, and we’ll be reading your blog. If you’re feeling adventurous, all you need to do to try it out is log in to draft.blogger.com instead of www.blogger.com. If you see the blueprint logo then you’re in the right place. Scheduled Post Publishing If you write a post on Blogger in draft and set the post’s date and time to some time in the future, we’ll schedule the post to appear on your blog at that time, and not before. Blog List Add a blogroll to your blog’s sidebar. The Blog List is powered by Google Reader, so it can show when each blog was last updated and even include post titles and snippets. Keep in mind these features are still being worked on, and let us know if you find any problems. Help your readers subscribe to your blog in their favorite feed reader with the Feed Subscription page element. Add any of the thousands of Google Gadgets to your blog’s sidebar with our Google Gadget support. Search over your blog, your Link Lists, or all the pages you’ve ever linked to with the Search Box. We post the latest news about Blogger in draft to the Blogger in draft blog. Stop by often and write comments about how the draft features are working for you. Don’t limit yourself to “reverse chronological” publishing. Our advanced Google algorithms put your best content at the top of your blog. Even if your later work goes downhill your previous posts will still shine. No more template languages to mess with or sidebars to get right. Our advanced Google algorithms automatically populate your blog’s sidebar with the most relevant possible content. Stop worrying about your PageRank or your search engine optimization. Post directly into Google search results for maximum visibility. Save your readers time and effort. We’ll automatically extract the most relevant sentence from your post for the index page, along with any necessary ellipsis. We'll also put some words in bold! Your blog’s header will stay fresh with new images from our team of artists, each and every anniversary of a scientific achievement. Unsure of what to post about? Just click “I’m Feeling Lucky” and we’ll “take care” of the rest! Excited? So are we! Take a look at this sneak peek of Blogger Buzz, powered by Google Weblogs. We’ve put together a quick video tour to take you through the highlights of Google Weblogs. Check it out!
. 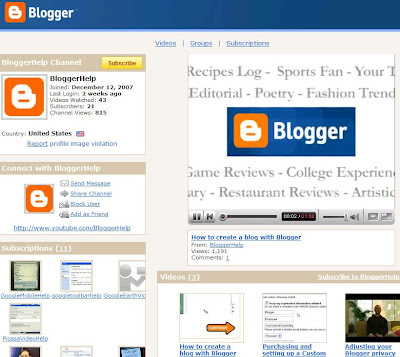 There you can find videos that show you step by step how to use Blogger features. In the coming months we'll be adding more videos. If you have a suggestion for a video you'd like to see, let us know by posting in our Help Group. In addition, you can give us feedback on each video's comment form. We're always trying to find new and better ways to help you use Blogger and we appreciate the feedback - thanks! For all you visual learners who want to add features to your blog, but don't have the patience to browse our help articles, we've created the new Blogger Help YouTube Channel. There you can find videos that show you step by step how to use Blogger features. Going to be in Austin for this year’s South by Southwest festival? That makes several of us! 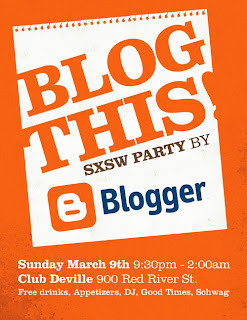 Blogger is once again rocking it out at Club de Ville [map] with delicious snacks, an open bar, Blogger Play, and our SXSW staple: climate-inappropriate schwag. The party starts at 9:30PM this Sunday and goes until 2AM on Monday. You’ll need an invitation to get in the door. Members of the Blogger team will be at the Interactive conference, so just stop anyone you see wearing a Blogger logo and ask. If it’s one of us, you’ll get an invitation. If it’s someone else, you’ll still make a new Blogger-loving friend. I'm saddened to have to do this yet again, but today we're saying our collective goodbyes to Graham Waldon, one of the longest-serving members of the Blogger team at Google. I was fortunate enough to have interviewed Graham before he joined us back in 2003, and after a few minutes of chatting I immediately knew he was our guy. 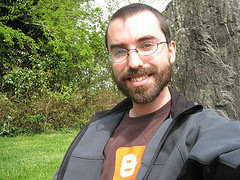 Over the years Graham’s provided amazingly patient and exemplary service to Blogger’s users, and set an impossibly high bar with his work — from constantly improving Blogger’s Help site, to personally answering countless help emails, to digging up fantastic Blogs of Note, to training new members of the Support team. He’s even moonlighted a bit, helping the Reader team with their support efforts! This is a quick post to announce that, in addition to Blogger’s recent improvements and fixes, we are now available in Filipino. There is already a very strong blogging community in the Philippines, and we’re very happy to support that and be a part of it. Want a taste? Start with our friend Aileen and keep clicking! Clearer identity options on the comment form, which now highlights some of the more popular OpenID providers more obviously. Posts with more than 200 comments have them split across multiple pages. Supporting these languages is a huge milestone for us because — unlike the other 37 languages Blogger is translated into — Arabic, Persian, and Hebrew are written from right to left. As you can see from the above screenshot, we had to flip the whole interface around. Besides localizing the Blogger interface into these three languages, we have right-to-left templates and have added new toolbar buttons for bi-directional text editing in the post editor. The effort was worth it, however, and we’re tremendously happy to be a part of the growing Arabic-, Hebrew-, and Persian-language blogging communities. 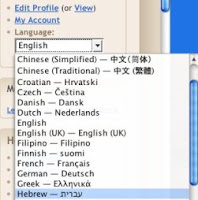 To see the Blogger interface in one of these languages, just use the menu on your Dashboard. You can also choose your language on Blogger’s homepage and via the “Language” link in the footer of most pages. From then on, all new blogs you create will default to using your new language choice. If you need to change the language of an existing blog, just go to Settings > Formatting and select a new language there. Your blog language affects date formatting and other blog text, and, with today’s release of Blogger, your blog’s comments form as well. Please note that your template won’t change if you’ve customized it with Edit HTML; we wouldn’t dare muck with your data! Also, if you’re still using a Classic template you will have to upgrade to Layouts in order to take advantage of bidirectional language templates. Learn how. We’ve also added right-to-left and left-to-right buttons to Blogger’s post editor. They’ll appear if your Dashboard language or your blog’s language setting is for a right-to-left language. Clicking on these buttons will set the paragraph you are currently editing to either right-to-left or left-to-right mode. This way you can write truly bidirectional posts. 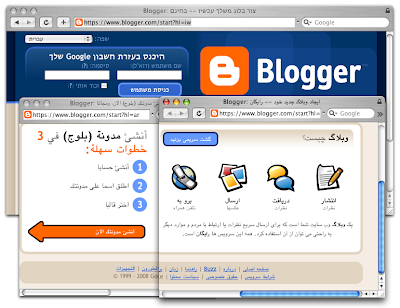 We are excited to announce that Blogger is now available in three more languages: Arabic, Hebrew, and Persian!